Woods began the day in a tie for second with Tony Finau, two shots back of Francesco Molinari, the defending British Open champion with nerves so steady that entering Sunday, the Italian had not bogeyed any hole since the 11th on Thursday. But Molinari's nerves and shotmaking skills failed him on the back nine Sunday. Holding a two-shot lead on the 12th tee, Molinari watched helplessly as his tee shot rolled off the green and into Rae's Creek. A double bogey was not enough to drop Molinari from contention, but the veneer of invincibility had cracked. If what happened at 12 was tragedy, what happened to Molinari at 15 was a farce. Playing conservatively to avoid the water on the par-5, Molinari found himself with what should have been a simple third shot onto the green. But he hit his wedge shot fat, popping it up into the air, off a nearby tree and into the water. He double-bogeyed the hole to drop out of a share of the lead. On the same hole, Woods made a conventional birdie-4 to take the outright lead for the first time. He secured his advantage at the par-3 16 by sticking an 8-iron within 2 feet of the cup for another birdie and a two-stroke lead. 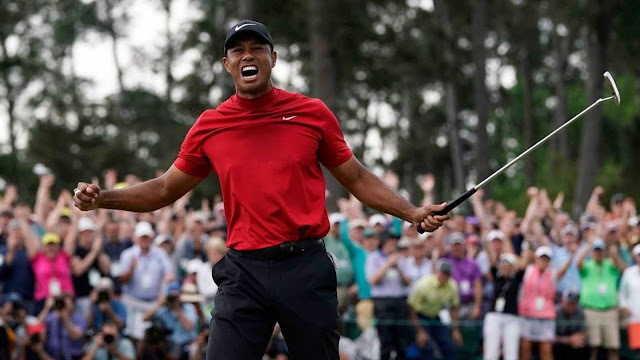 That birdie, along with a missed birdie by Koepka on 18, gave Tiger the cushion he needed to finish with a bogey-5 and secure his fifth green jacket and 15th major, trailing only the great Jack Nicklaus in both categories.